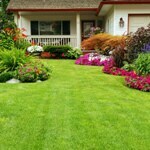 Home » How-To Library » Aeration: Is It Right For Your Lawn? Whenever it comes to landscaping, it's always best to think like a golf course greens keeper. And one of the hard-and-fast rules most greens keepers employ is aeration. Aerating your lawn is a great way to keep it healthy and thriving. We'll go over exactly what aerating is, what it does, and how to determine if it's needed for your lawn. No matter the implement you use, aeration is essentially just putting holes in the soil to improve the flow of oxygen, water, and other nutrients to the roots in the grass. Aeration actually causes initial damage to your yard, as it puts holes in the soil and may tear some roots, but in the long term, it improves the overall health. 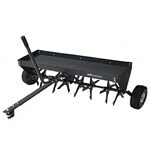 Typically, an aerator is a tow- or walk-behind implement with lots of tubes (core-plugs) or spikes on it. As this is towed across the grass, the spikes pull out 1-3" cylinders of soil. These holes allow for the extra moisture and air to penetrate. Probably. But let's get into why. Greenskeepers aerate their fairways because the soil gets compacted from all the walking on it. But even a small dog or kids playing can compact your soil. If you have activities on your yard, you should aerate. The other main reason to aerate is if you have clay soil. 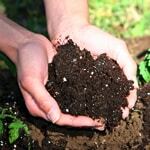 Although lots of trees and shrubs can grow well in clay, the roots of most annuals, perennials, and vegetables just aren't strong enough to make their way through the stubborn clay. Aerating will improve the health of the clay soil, introducing essential nutrients and providing more favorable growing conditions. Generally, you'll want to aerate your lawn in the spring. This is usually done in March or April, prior to plants blooming. However, in years with long winters or cold springs, aerating in May is fine too. Remove all the weeds from your lawn before aeration. Otherwise, aeration can spread the weed pores. If you wait until the summer, the odds are your soil has hardened, making it difficult to remove dirt plugs. Also, if it's the hot part of the summer, aeration will make your grass dry out more quickly. Some people prefer to aerate in the fall, but you want to make sure you do this at least four weeks prior to the first frost. This allows time for the additional air and nutrients to do their job. If you live in a very arid climate, or your yard gets trampled routinely, then you can aerate twice a year. Aeration: Is It Right For Your Lawn? - Find Out How To Know If You Should Aerate. Our lawn mower how-to library can help you pick the perfect reel lawn mower, push lawn mower, riding lawn mower, zero turn lawn mower, lawn tool or lawn mower accessory.